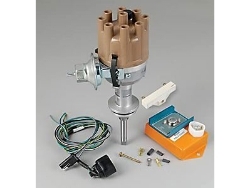 This complete Electronic Ignition Conversion Kit is suited to replace a vehicle with a points distributor or worn Electronic Ignition Distributor. This Distributor comes complete with distributor cap and rotor button. It also has an adjustable vacuum advance. Another major plus for this ignition kit is it has a Stock Advance rate built in. Generally on most B Engines, you can install the distributor, and set your ignition timing the popular way that most people have learned over the years. Basically setting distributor to your original timing setting and connect vacuum advance to a PORTED vacuum source on your Carburetor.